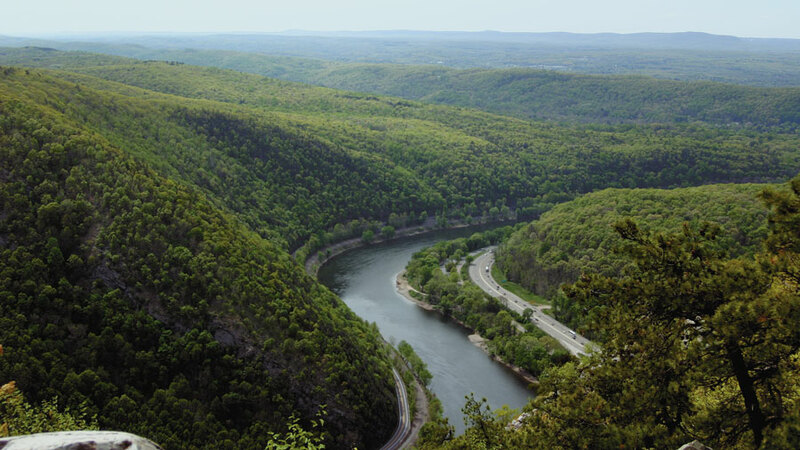 The famous notch that characterizes Warren County's western skyline is where the Kittatinny Mountains have given way to eons of gentle persuasion by the Delaware River, creating one of the most majestic of New Jersey's natural features between Mount Tammany and Mount Minsi in Pennsylvania. Because of the philanthropic tendencies of a family named Worthington, and the accidents of history that created the National Recreation Area here, the confluence of water and earth at the Delaware Water Gap promises hikers a bounty of blissful steps through exquisite terrain. The view from Indian Head atop Mt. Tammany at the point of the Gap overlooking the Delaware River. You get to the Water Gap Mountain from either Worthington State Park, the Old Mine Road in the National Recreation Area, or from Blairstown on the east side. Once a family estate, Worthington State Forest comprises almost 6,000 acres extending about seven miles along the Kittatinny Ridge. 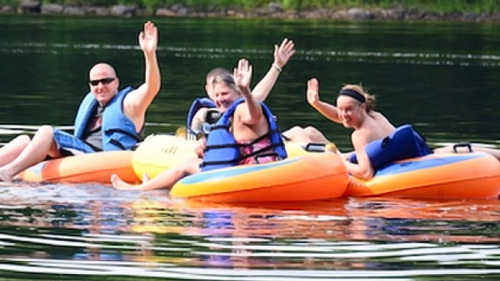 It lies within the Recreation Area, originally condemned in the 1960s to be a gigantic reservoir, and which extends another 70,000 acres into Sussex County and the Pennsylvania Pocono region. The area proximate to the Gap contains somewhere close to 70 miles of trails which lead hikers to breathtaking overlooks, sublime glens and ravines, rugged outcroppings, a glacial lake, ancient copper mines and endless hours of serenity. The most spectacular view is offered immediately from the Worthington access off Route 80, a short but vigorous hike (including one 30 foot high rock climb) up the Red Dot Trail to the top of Mt. Tammany at the point of the Gap. The Red Dot is the 1.5 mile rim trail leading to the peak and then to a fire road along the eastern edge of the Kittatinny ridge. The Blue Dot trail takes you to the same spot along a longer (2 .5 mi.) but less strenuous interior route stemming from the Appalachian Trail, also accessed from the parking lots at Worthington. When you reach the top of the Indian Head formation you are about 1200 feet above the river and can look across to the continuing ridge in PA and Southwest along the valley to Scotts Mountain near Phillipsburg, down to Washington and sometimes about 40 miles all the way to Glen Gardner in Hunterdon County. Hikers can go up one way and down another for an exhilarating loop. View over Warren County from the AT. A section of the 2,000 mile, Maine to Georgia, Appalachian Trail runs right over the top of the ridge, acting kind of like Main Street in this prime Kittatinny neighborhood. Its about 3 1/2 miles from the Interstate up to the Sunfish Pond natural area, and the beautiful glacial lake makes a perfect anchor for a long afternoon's walk above the Dunnfield Creek ravine. Beyond the pond the AT provides more spectacular views along the seven mile stretch to Millbrook Road. The trail crosses an area called Raccoon Ridge near the Upper Yards Creek Reservoir facility above Blairstown. A narrow razor-back where a ridge ends, Raccoon Ridge is one of the few spots that affords views down to the river to the west and broad vistas to the east. You can also access this popular area via the Coppermine Trail or Kaiser Trail from the Old Mine Road in the Recreation Area. Other routes from the Old Mine Road include the Garvey Springs and Sunfish Drainage Trails, so hikers can travel loops of various lengths and difficulty. 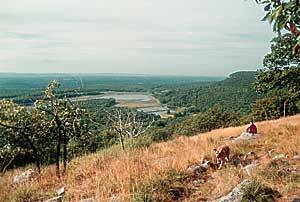 You can also walk five miles from Indian Head along the Kittatinny eastern edge on Mt. Tammany Fire Road to the relatively flat Turquoise Trail, over to the Sunfish Pond fire road and into the Raccoon Ridge area. This trail ends at a fence barricading the Upper Yards Creek pumping facility. Obey the rules and do not cross the fence; for if you do at the wrong time- the moment water is released from the top impoundment to the lower- you may end up as a fine red mist spewing from the pumped storage generating turbines. From here you can finish the 14 mile loop following the Dunnfield Creek trail back down the gorgeous ravine, accentuated by serene pools and glorious forest. Sharp eyes might detect the remnants of a foundation- there was once a sawmill here. In fact, once upon a time there was barely a tree left on these mountains-- all gone to feed the forges and furnaces. Many of these trails are the descendants of logging roads. Or they have been more recently born of fire-fighting efforts in the forest. If you enter the park on the Old Mine Road, right before the bridge over the Delaware, you bear right and meet the 3-minute light which meters traffic along a narrow stretch of road, able to handle only one lane of traffic. You can park here and access the Karamack Trail, an abandoned railroad bed that offers a flat, packed cinder path, accessible even to a wheelchair along some of its lovely contour along the river. Another mile up the Old Mine Road brings you to the Fairview Hiking Area and the Beulahland Trail, an alternate path up to the AT and Sunfish Pond. Another alternate up the western side of the ridge is the Douglas Trail, which begins about 4 miles north of Route 80 and hits the AT just south of Sunfish Pond. You can walk along the west side of the pond and hook up with the Garvey Springs to head back down to Old Mine Road for a nice 4.3 mile loop. Coppermines Trail, named after the remnants of the Dutch mines dating from the 1600s, begins almost 8 miles down the Old Mine Road and runs to the AT just south of the Mohican Outdoor Center, an old camp now operated by the Appalachian Mountain Club. The camp sits on Catfish Pond, a few miles north of Sunfish Pond and the Yards Creek area, and from which you can begin another loop around what is called the Rattlesnake Swamp. 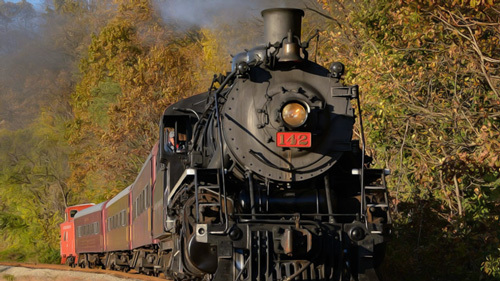 These trails are also easily accessible from the east at Blairstown's Mohican Road and from Route 602 at Millbrook Village to the north. The Mohican Center sponsors a series of hikes all over the Park during the summer. (See our calendar or call 908/362-5670. Back down at the Old Mine Road you can pull off and get into Van Campens Glen which, for good reason, is among the most popular places near the Gap. Here it is the interior scenery that is spectacular as the cool beauty of the brook brings you to spots that will certainly make you smile. In a few minutes, you can find solace here... or perhaps a memorable moment with a friend. Traversing these steep slopes, often covered with loose shale, requires sturdy boots or climbing shoes that will support your ankles. Make sure they're broken in and bring extra socks- wet, sweaty socks in leather boots are very uncomfortable.